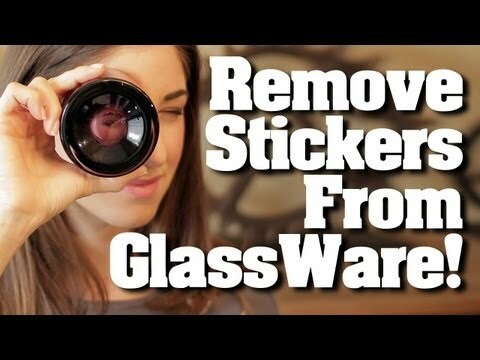 Remove Stickers from Glass in Minutes! Price tags can be your best friend when they are marked “clearance”, but every retail shopper has at one time or another experienced sticker woes. There is a special kind of heartache that comes after taking careful time and focus to peel a sticker off of a new glass item, only to find you’ve merely removed the top layer. With the bulk of the sticker still gripping tight to your new mirror, vase, or picture frame you begin to desperately scratch taking off streaks with your finger nails, but never able to get down to clean glass! Now that we have relived that awful anecdote together, it is time to talk solutions. There are a few tried-and-true solutions and home remedies for extreme sticker removal that are sure to leave no outline behind. Try any of these mentioned below for clean sticker removal every time. This method is perfect for glass items small enough to completely submerge in a pot, Tupperware, or the kitchen sink. For especially large items, the bathtub is always an option. Fill it up with soap and water as hot as your sink can produce. Let the glassware sit in the water for ten or twenty minutes before you even make an attempt at that sticker. The longer it stays submerged, the weaker the sticker’s adhesive will be. You may also use washing soda in your glass item’s warm water bath. Washing soda is similar to baking soda but stronger. It is the main component in most laundry detergents for its stain lifting capabilities, which makes right for the job of cutting through sticker adhesive. If soap and hot water didn’t work, it is likely because the sticker you are dealing with is especially troublesome, and your water wasn’t hot enough. For a clean removal to take place, the glue needs to have melted, and different stickers mean different types of glue, and subsequently, different melting points. To turn up the heat, you will have to employ a hair dryer. Turn it up as high as it can go, hold it a 2-4 inches away from the sticker and keep it there for a few minutes. You won’t have to worry about the product itself as glass has a melting point of about 2,500 degrees Fahrenheit. The tricky part about using the hair dryer is that you have to be quick once you are ready to remove the sticker. This is because the hair dryer is using hot air to increase the temperature. Unlike water, the air will not sit on the surface of the glass to keep it warm for a while. Instead, that glass item will begin cooling once you turn the hairdryer off. As soon as you do, work at the corners to give yourself a tab to pull on, and then employ the band-aid method. If neither a hot soak or a hotter blast of air has done the trick, it is time to call in reinforcements. WD-40 is liquid gold and should be in every house all over the world. There is very little that cannot be fixed with a can of this sweet stuff and maybe some duct tape. 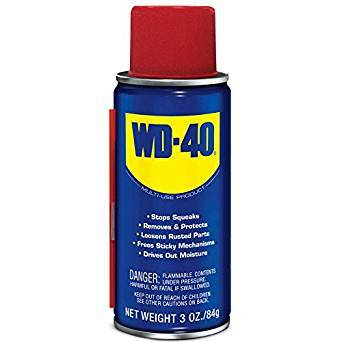 WD-40 is a machine grade lubricant. Soaking the sticker with this stuff should begin to dissolve the adhesive. Once you have soaked the sticker thoroughly, rub your thumb over the sticker with some muscle behind it. After a few passes, the adhesive bonds should completely break and the sticker should slide away. If you’re worried about toxicity, there are some alternative sticker removing potions you can manufacture from products you likely have around the house. Baking soda is a solid natural degreaser and cleaner. When mixed with a little cooking oil, it becomes a kind of paste. Apply a nice liberal layer of the paste over the sticker and let it sit for a few minutes. The consistency of the oil and baking soda mixture creates a more steady delivery system of the alkaline properties of baking soda to the adhesive. With a semi-abrasive cloth or sponge, the paste and the sticker should come right off. If after all this that sticker is still holding strong, your best bet is to return the glass item. It’s not worth it! All kidding aside though, armed with these household tools, there is no sticker that stands a chance.